These are absolute insanity. I probably should have shown you these long before Halloween so you could add them to your menu, but as you can see, I’ve not posted a Tablespoon Tuesday post since we landed on the moon. I have an excuse! They launched a new site and there were bugs and I couldn’t figure out how to use it so I ate chocolate and sang to myself instead. But these. These are complete madness. They’re mouthwateringly creamy, seductively spicy, charmingly cheesy, and need to appear in your face like five years ago. No polenta cake left behind. DEWWW IIIIIIIT. 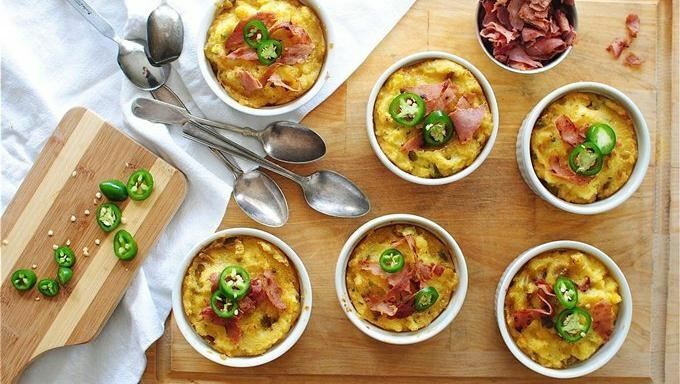 Mini Jalapeno Polenta Cakes! Chipotle Chicken Chili + a Pioneer Woman Cookbook Giveaway! I agree with, Brian! These just got added to my Thanksgiving must make list! I want these for lunch...EVERY DAY! Also, I totally threw my head up and did the evil laugh/howl with you there at the end. Love. YUM!!! Corn anything is always a win for me, but I've definitely had some polenta sitting in my pantry waiting to be used for a while now. I'll skip the ham to make it vegetarian-- means I desserve extra, extra cheese, right?! Awwwwww snap! (yup) Not too late to make this weekend I have all the ingredients on hand Woop! Looks so delicious! I'll be adding these to my appetizers for the holidays! These. Are. Adorable. Yup, that's all! These look SO good! I love anything jalapeno, and polenta! These look yummy! If one didn't have ramekins on hand (I know, I know) can you give me some guidance re pan size and cooking time? You could even put them into some oven-safe coffee mugs! Even in a casserole dish (9x13) the cooking time should be the same. Let me know how they turn out! This looks amazing. I think we are going to have to find a time to add this to our dinner menu at my house this week. Great pictures too!